On one of my first few days in Kyoto, I went to the Kyoto Goen National Gardens and the Kyoto Imperial Palace, which is set within them. On my way there, I walked past the Goo Shrine. At this stage I had not yet understood that I would see shrines everywhere I went. This one caught my eye because of all the statues of boar. I was immediately puzzled. Clearly in my mind a wild boar is only ever a threat. I soon came to understand that fearsome, potentially lethal beasts can protect you from your enemies! This was a whole new thought for me, generated at this shrine which commemorates a wounded warrior who escaped his pursuers with the help of 300 wild boar, and was healed by a miracle. I walked on to the Imperial Palace in its immense grounds. First there came the Muku Tree, beside which an ancestor was killed many, many years ago. I loved the fact that this tree was the thing being commemorated, and was astonished by the way the tree was being supported. And there it stands, right by the Imperial Palace. It was a punishingly hot day in which I took much less pleasure in this wide stretch of gravel with no sign of shade, than I might otherwise have done. But the imposing scale of the Palace is undeniable. Some parts of the Palace were inaccessible because they were under repair or renovation. In Kyoto it was always evident that the past is constantly under repair. Nothing is exactly as it would have been hundreds of years ago. In many cases entire buildings have been completely rebuilt after fire, flood or war, in this country where fire has been such a major issue for so much of human history. When we were there flooding was extremely recent, with many loves and homes lost. Typhoons were coming, and we sat through a small earthquake in Tokyo. The gardens were spectacular and so were the exteriors of the buildings, which eviently contain major works of art I didn’t have the chance to see. The sculpting and protection of trees and shrubs was very striking here too. In the image below right you can see a tree entirely supported by a circular structure. Should you wonder whether I come from a culture in which this is done–I cannot find an English word that could describe this structure and the closest practice to this I can think of would be espalier–or perhaps creating a hedge. And there you have it–another world heritage listed site from Kyoto full of beauty and wonder. I have belatedly realised that I didn’t start my account of our trip to Japan at the beginning. We began with a day, just one, in Tokyo. Of course, we could see little in this time, but how amazing to be in Tokyo at all! My beloved’s internet hivemind of global travellers had said that the fish market was the place to see. So we were booked into a hotel right on the edge of the market. I didn’t realise my beloved had cunningly planned this, so was delighted and surprised when we came out of the hotel right onto the edge of the part of the fish market that was out on the nearby streets. Crowds of people, cooking on the street, and stalls with all manner of things from vegetables and pre-cooked food to knives and dishes. And fish, of course. I even saw dried, smoked fish being shaved into bonito flakes. I can see from my photos that I was taken by Japanese-style cuteness right from the start… and that I felt I couldn’t take pictures of all. the. things. So many amazingnesses!! I know what it’s like to have people photographing everything in the central markets in my home city. And a friend who grew up in Taiwan has since informed me that for any person from China, a fish market would be the obvious place to see in a new city. Eventually, we left the fish market and I followed my bold beloved onto the train system. Needless to say, unfamiliar plants and places and things were everywhere. I couldn’t get over these capsule stations, full of weird and wonderful things. This display was in a department store, in a stairwell or corridor. After some wandering about in a shopping district, we took a break in a beautiful park. We had to investigate what “pachinko and slot” was (as it is advertised all over the place and in very big buildings). I have since read Pachinko by Min Jee Lee, which is more of a multi generational account of Korean immigration in Japan than it is an account of pachinko–but pachinko is a low-end form of gambling that is a little like pinball. It is very loud and accompanied by the smell of cigarette smoke, so far as we could tell at first sight, and apparently a predominantly a male occupation. We had a very funny experience of being in a shop in the geek district of Tokyo and being hailed by an Australian friend of my beloved. Just so we’re clear–Tokyo itself has a population almost the size of the entire country of Australia. And–the pictorial signs of Japan were gratefully received by me with my pitiful Japanese, but they also have a very different aesthetic to Australian signage. This one I especially enjoyed. I held onto my hat. And then we had to travel to Kyoto. There had just been major flooding in Japan, not far from Kyoto, so we were lucky to be able to catch the train at all. Some of my beloved’s students had arrived early and been evacuated along with locals, and others had struggled through travel rearrangements made necessary by damaged rail lines and roads. While we didn’t catch the fastest train Japan has to offer, it was still very fast by Australian standards. And very clean and lovely too. All the signage inside the carriage (about the next stations and such) was in at least three languages–more gratitude from me. I spent the time taken to travel out of Tokyo marvelling over its size and density. Oh, and knitting a sock. Once we left Tokyo and were in more rural areas, I was amazed to see rice growing all the way up to the train line. I don’t know why, exactly, as wheat grows up to the train line in Australia. But even seeing rice growing is pretty amazing to a person from such a dry place. People live right up against the major inter city train lines too, and there were market gardens all the way to the train line that we passed. We passed Mount Fuji in the distance too. Even just being on the train made vivid why so many lives and homes are lost in floods, typhoons and mudslides in Japan–people live very densely by comparison with Australia. The heartbreak and trauma of the flooding just before we arrived was plain even through the language barrier on Japanese TV news each night. And for the train buffs, here is a view of the train from the front, most unlike any Australian locomotive I’ve encountered. Much faster and much quieter too! The Japanese wrapping cloth or Furoshiki is sold all over Kyoto as a souvenir and there are simply gorgeous prints available all over central Kyoto. 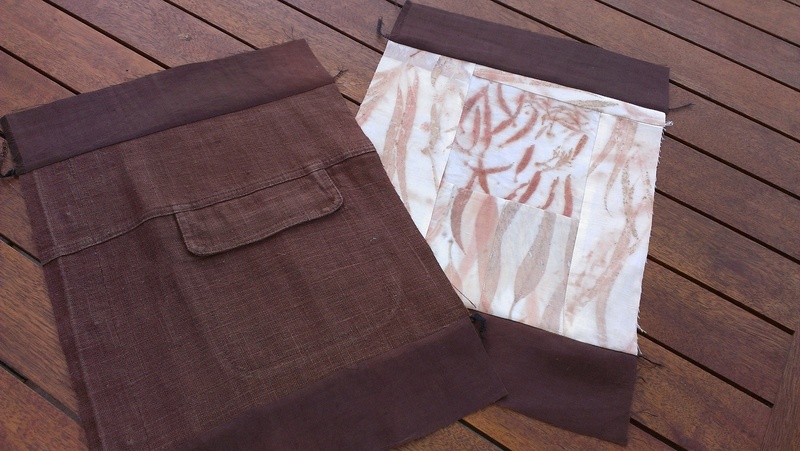 Less often, indigo or other plant dyed furoshiki are available. the furoshiki is the kind of multi purpose staple item surely basic in many cultures where once, having a piece of fabric to use would have been so significant it would have had many uses. The furoshiki is still in use and maybe even having a resurgence in Japan. See one tutorial about how to wrap your lunch box here. I did not see them in use a great deal while in Kyoto, but I did see them being used: most notably one evening when I saw a middle aged man riding his bicycle in a yukata, with two packages the size and shape of framed paintings wrapped in furoshiki in the back basket. I went to one shop several times where the charming and generous woman who was serving in the shop had an extraordinary show and tell, demonstrating how to use furoshiki. She said she had made YouTube videos and I hope this one is her! One day my friend was trying to explain something she wanted to buy in a chemist and I spent that time roaming around looking at all the things. Wondering over depictions of Japanese manly attractiveness and womanly attractiveness, for instance. Wondering what it is like to live in a place where cosmetics are advertised with pictures which include the good looking young woman whose appearance is being improved by the advertised product (I’m guessing) playing violin (top right image in the right hand photo below). Imagine my surprise (because a lifetime living in Australia) to discover that in Japan, cleaning your ears doesn’t necessarily involve cotton buds (Q tips). Here are two different models of ear pick. My eyes popped out! But once I knew what they were I realised I was looking at bamboo ear picks as a low price point item in a knife shop. Then I saw them in the museum of traditional arts and crafts, complete with a silky tassel. Yes, I brought one home. Yes, I’ll be careful. 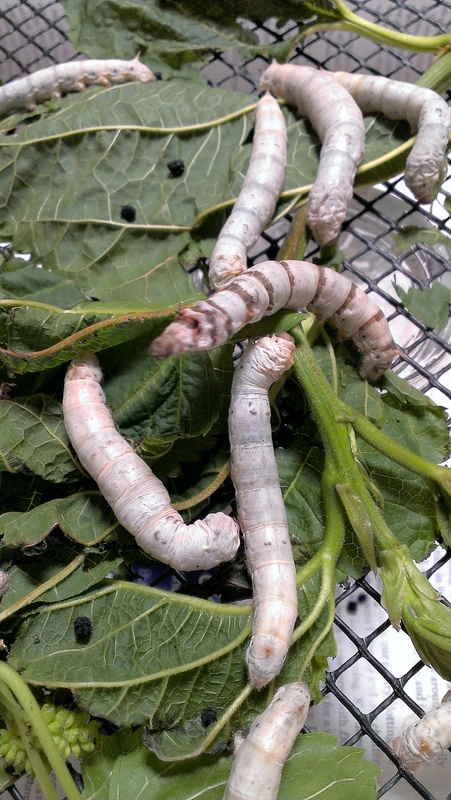 Here is a picture of one silkworm starting its cocoon, or to put it the way we’ve been putting it around here, ‘becoming silk’. 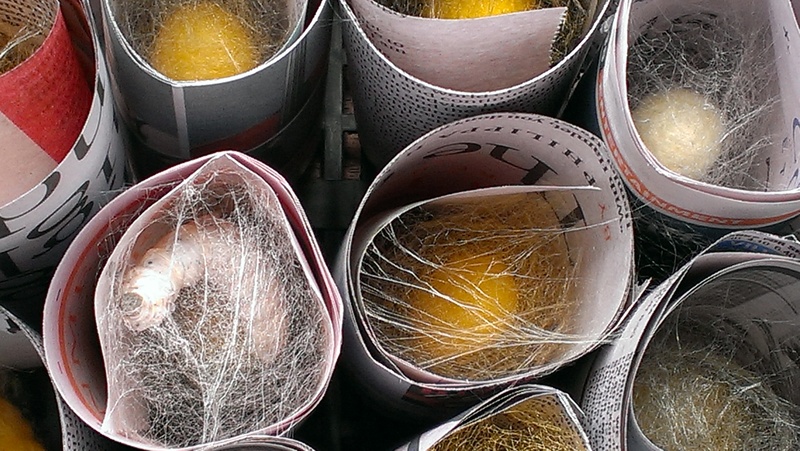 We have cocoons in two very distinct colours. Mysterious. 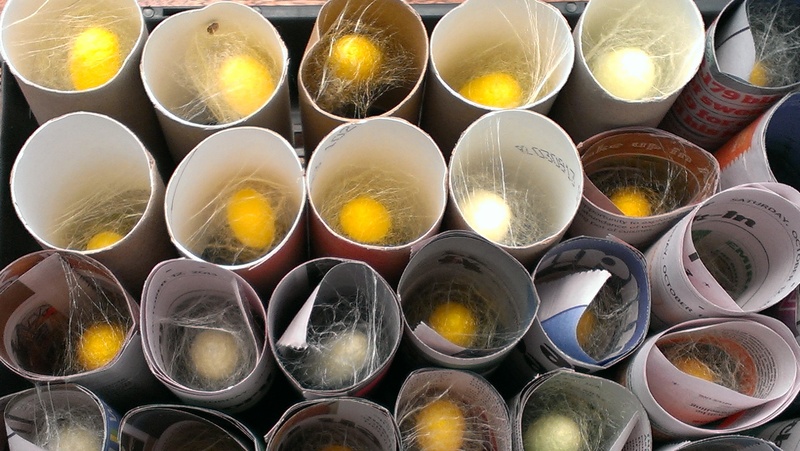 All of the cocoons last year began pale and became golden very quickly–within the first 24 hours. Not these. Some are pale silver-white, with a slightly green hue in some cases. 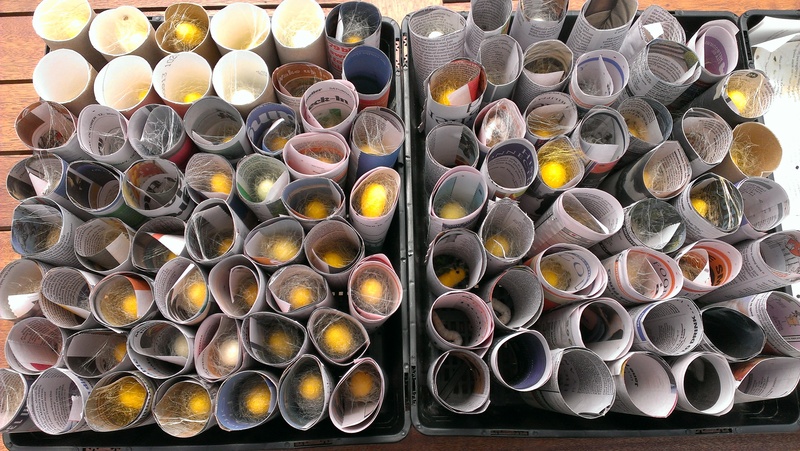 This is the view from above, looking down on a tray of paper and cardboard tubes. We have quite a few. And about 28 still to add! Luckily, I gave away about 70. Some of which have been delighting schoolchildren, apparently. I am feeling deeply grateful to the friend who told me there was a mulberry tree behind the Japanese garden in the parklands. It turned out there were three trees, two varieties of mulberry, and one of them was trailing leaves on the ground and down at head height across a path. Begging to be pruned when I happened to pass with secateurs and a big bag, I tell you! I even ate a couple of mulberries that were almost ripe. Pecans do grown in this part of the world, even if they are not terribly common. 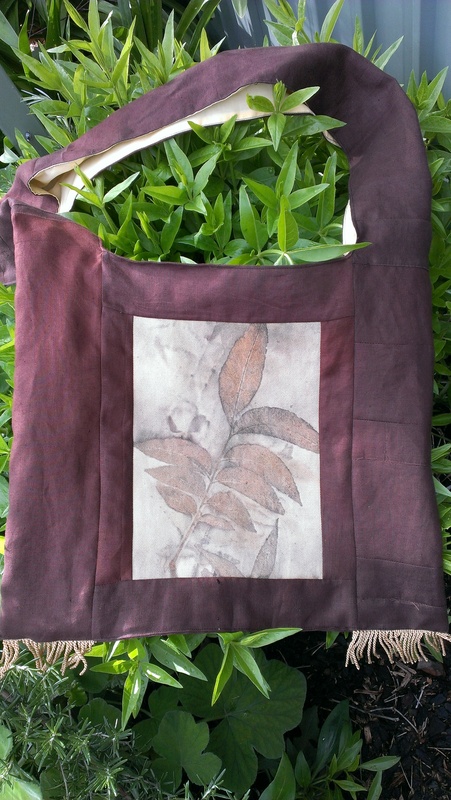 A long while back I wrote about leaf printing with pecan leaves from our friends’ tree. I have had it in mind all the while to make them something from those leaf prints. Finally I have made good on this idea. In fact, my beloved saw one of our pecan-growing friends yesterday and told her I’d made them a gift… so this bag is destined for the post sooner rather than later. 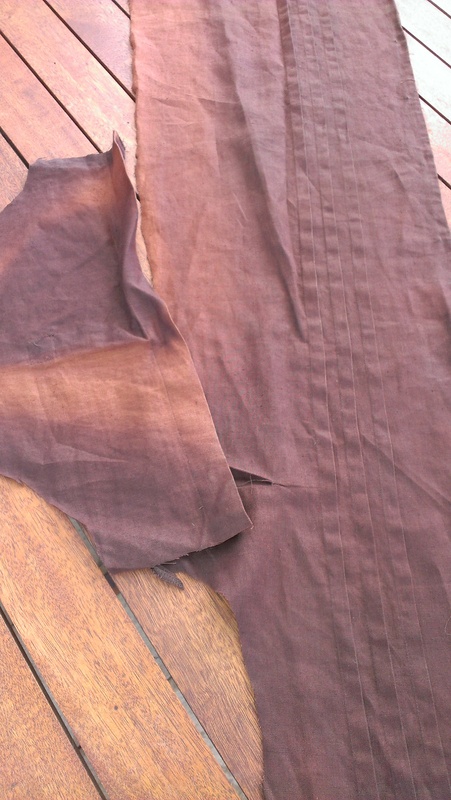 I started out with this sun-faded linen frock–the shades of colour you see are not effects of the sun falling on the fabric but the impact of fading. I think I paid $2 for the frock at a red cross op shop. The lining has a pocket from a recycled ramie shirt, and a patchworked panel of leaf printed silk offcuts from another recycled frock. Here are the inside panels ready to be stitched to the rest of the lining. The remainder of the lining is yellow. A long time ago there was shop in our neighbourhood that just sold offcuts from a sheet manufacturer, and having made entire quilts, bunting and bags from those offcuts I still have some left! Here is the finished item on top of my madder patch. The madder is appreciating the warmer weather–at least until it gets too hot for it to enjoy, and I am hoping my friends will like their present. The gifts of mushrooms continue! 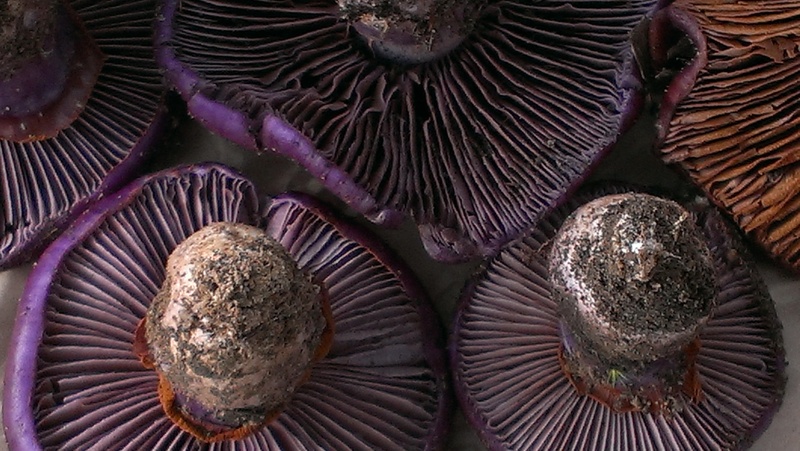 My neighbour the mycologist came around with a gift of Cortinarius Archeri in many shades of purple. He had heard they could be used for dyeing, would I like to try them out? Aren’t they glorious? 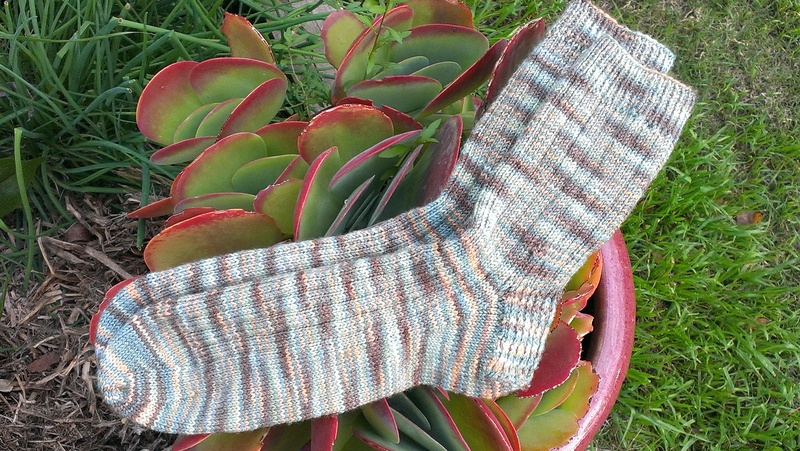 It seems to me as though I’ve had three pairs of socks on the needles for a very long time. At last this pair have emerged: 50/50 silk and wool from Kathys Fibres, a dyer local to me, in Forest colourway. The sock is just the plain ribbed one that lives in my mind, but I’m hoping they’ll be warm and comfy for a fellow knitter and dear friend who is facing a tough time. No one has ever knit her socks before, though we’ve compared notes on lots of pairs she has knit for other people. It’s about time. 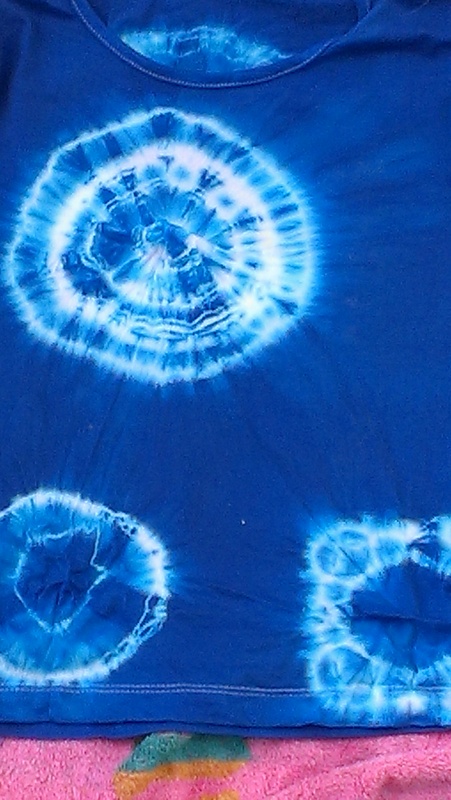 A friend from work told me her 6 year old had said he wanted to try tie-dye. So I invited them over! In the end there were two 6 year olds and a 3 year old, and 4 adults of varying ages and stages. We were spoiled for colour choices but had only two pots, so after some lovely parental problem solving we ran a red pot and a blue pot and transferred one garment from red to blue to make purple. I believe this t shirt was worn to childcare every day for some days after emerging in all its glory onto a towel designed with a tie dye aesthetic in mind. 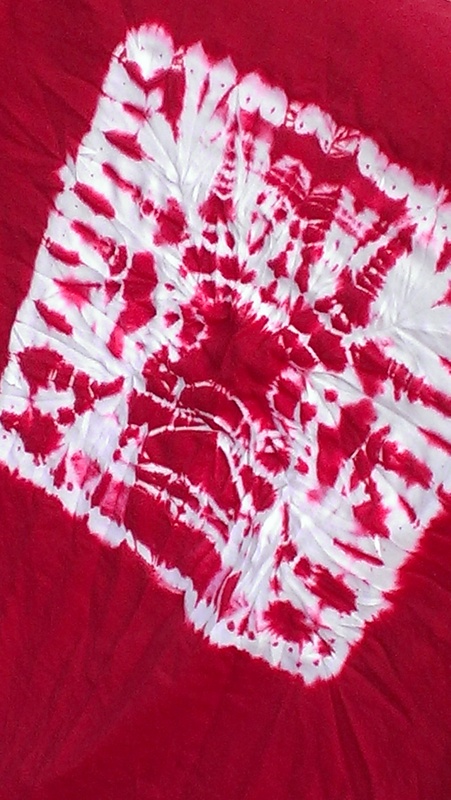 Fancy having a Dad who is not intimidated when you say you want a monkey face on your tie dye and instead creates this! 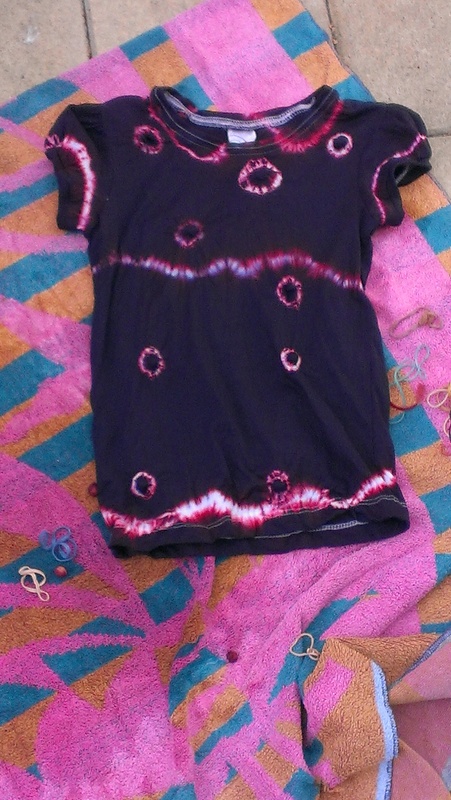 I think the last time I tie dyed in this style would have been with Mum, in the 1970s. Just once. It was an honour to be in charge of the dye pots and watch such fine parents encourage and be encouraged by their lovely children.